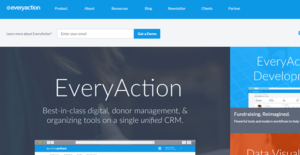 EveryAction is a fundraising, donor management and advocacy CRM designed especially for non-profit organizations. It helps organizations manage fundraising, donors, and volunteers using a unified platform. The CRM solution helps organizations of different sizes to effectively manage their campaigns, including donation, fundraising, emails as well as advocacy. These result in a supporter base that’s highly engaged, which is made possible by features such as integration with social networks, one-click donations, and better event management. The unified platform encompasses online donations and actions, targeted emails and advocacy, which help organizations segment and manage data in a better way. Powerful reporting tools are also part of the digital and unified platform. They are designed to support the unique requirements of non-profits in mind. EveryAction offers a variety of tools that make it easier for non-profits to manage multiple tasks from a single platform. Its fundraising tools cover multi-channel campaigns, donor management, monthly giving, segmentation of campaigns and reporting. Digital marketing tools allow organizations to run targeted email campaigns and easily setup one-click donations and online actions. Social network and peer-to-peer integration help spread the word and boost engagement while keeping costs low. The advocacy features include social advocacy. It helps non-profits meet federal, state, as well as custom advocacy targets. Organizational tools empower organizations to effectively manage volunteers, events, voter contact, and member activation. Charts and graphs enable even non-technical users to easily visualize data and get a bird’s eye view of campaigns and activities. The unified CRM allows non-profits to leverage more than 47 million Action Profiles that speed up the listing process and help pre-fill forms. Reporting and PAC compliance is built right into the fundraising database, while the platform also offers 360-views of fundraising, events, digital and volunteers. The 360-view is made possible by collecting data sets such as donation history, petition signups, and email engagement. Multi-channel tools improve communication and enable organizations to effectively coordinate activities. Unique volunteer profiles make tracking and managing volunteers easier and allow adding information such as activities, roles, shifts and more. These details can also be customized according to each campaign and provide more flexibility to organizations that frequently deal with information updates. If you are interested in EveryAction it might also be a good idea to analyze other subcategories of Best Fundraising Software gathered in our base of SaaS software reviews. There are trendy and widely used systems in each software group. But are they essentially the best fit for your enterprise’s unique requirements? A trendy software application may have thousands of customers, but does it provide what you require? For this reason, do not blindly invest in popular systems. Read at least a few EveryAction reviews and mull over the factors that you want in the software such as the fees, main tools, available integrations etc. Then, select a few solutions that fit your requirements. Try out the free trials of these platforms, read online comments, get information from the vendor, and do your investigation thoroughly. This in-depth research is sure to aid you choose the finest software solution for your organization’s specific needs. How Much Does EveryAction Cost? EveryAction pricing for small non-profits starts from $49/month. Accurate pricing details are available by quote. We realize that when you make a decision to buy Fundraising Software it’s important not only to see how experts evaluate it in their reviews, but also to find out if the real people and companies that buy it are actually satisfied with the product. That’s why we’ve created our behavior-based Customer Satisfaction Algorithm™ that gathers customer reviews, comments and EveryAction reviews across a wide range of social media sites. The data is then presented in an easy to digest form showing how many people had positive and negative experience with EveryAction. With that information at hand you should be equipped to make an informed buying decision that you won’t regret. What are EveryAction pricing details? What integrations are available for EveryAction?